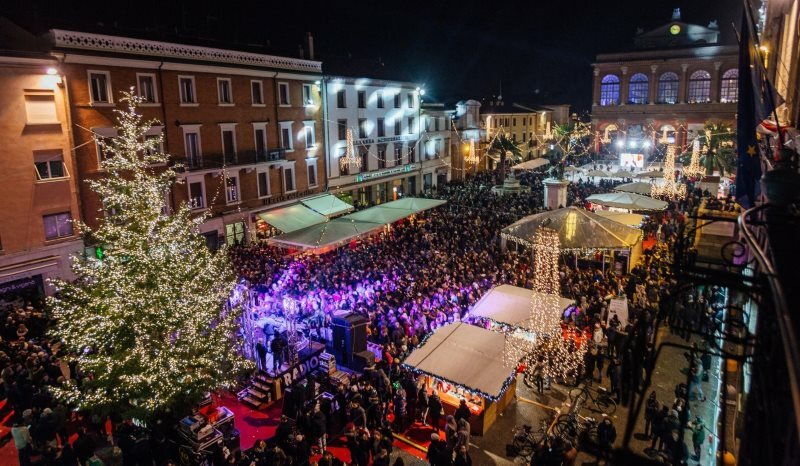 Rimini welcomes you...to the new edition of the longest New Year’s celebrations in the world! From 1st December 2017 to 7th January 2018 every corner of the city turns into an outdoor stage for a month of music, art, performances and Christmas events. The spectacle of the illuminations, the art exhibitions, Christmas markets, ice skating rinks, traditional Nativity scenes and those made from sand will make the city bright in a special atmosphere of the most anticipated holidays, creating a new and welcoming light on the whole city. The highlight is as usual on December 31st with the many New Year’s Eve celebrations spread throughout the city, starting with the great live concert in Fellini square with two special guests Nina Zilli and Daniele Silvestri who will lead the audience towards the new year through a musical journey, with the best Italian music as protagonist. A fresh ‘art crossover’, where notes, compositions and the best hits of their career will mix and fight. The longest night of the year, started just few steps away from the sea, will continue with 'widespread New Year' events in Rimini historic centre, a series of events and parties scattered all along the heart of the city, for a special night, long and rich in proposals. The party keeps on until late filling theatres, squares, streets and worksites with its music and lights. The first stop is Piazza Cavour, heart of the centre, that for the last night of the year will host the ice rink of Rimini Christmas Square and the dj set of RDS Radio followed by a line up that will mix rock together with 80s and 90s revival vintage atmospheres by Velvet for a evening in the name of 'Retropolis'. Once again, the main feature of the night in the square is the hall of the Galli theatre, where, among the picture cards from the best albums of our lives, with the extraordinary Panini picture cards collection, everyone will be able to access the second floor, where the elegant Sala Ressi will host an unreleased and complex music and dance composition. Just few steps away, in the heart of piazza Malatesta that soon will become piazza delle Arti, with the magnificent Castel Sismondo in the background, a show of lights and sounds will be staged with the music of Boosta dj (from Subsonica) which will celebrate the features of the new year in the best possible way. A new year which will be the 600th anniversary of the birth of Sigismondo Pandolfo Malatesta, Lord of Rimini and among the undoubted protagonists of the Renaissance. The new entry in this city New Year’s Eve will be the square above the water of the bridge of Tiberius, where the poetry of the hamlet will mix with the bridge’s bimillennial solemnity and the virtual technology that will fire up the night. 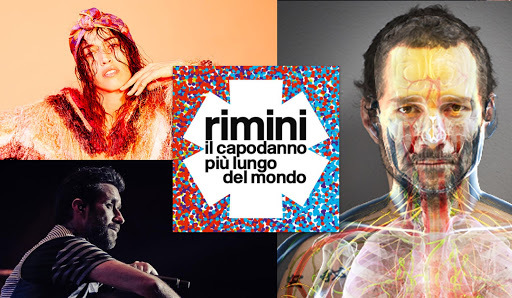 One of the most enchanting places of Rimini’s historical centre, the Complesso degli Agostiniani, will host a double music event that, through music and dance, will mix Cuban and Afro-Caribbean rhythms with rock/electro sounds. The rooms of the former city hospital (modern wing of the city museum) will host signature original photo sets to celebrate the new year, alternating with ambient dj sets. Few steps away, in the city museum, muic meets art with the concert and midnight toast in the Sala del Giudizio, among 14th century frescos. Special opening even at the Far in piazza Cavour and at the Domus del chirugo where, among the mosaics in Eutyches’ rooms, the notes of Filippo Malatesta will fill the room, accompanied by the refined arrangements of the Eos string quartet. Initiatives and events will carry on in the new year till January 7th, starting with the New Year’s Eve’s Opera staged for 2018: AIDA, on 1 and 3 January. The four-acts melodrama, libretto by Antonio Ghislanzoni, from a French prose version by Camille du Locle, script by Auguste Mariette, music by Giuseppe Verdi, will be directed by Paolo Panizza, with the G. Rossini Symphony Orchestra from Pesaro and the Galli choir, trained by Matteo Salvemini, and directed by the choirmaster Massimo Taddia. Not to be missed, for all the children, the events on Epiphany Day, when the Befana arrives, the old woman who delivers gifts to children throughout Italy..